To help safeguard the citrus industry from potentially devastating pests, the Australian Government has announced an additional $352,000 in funding to support better pest surveillance and early detection. Citrus Australia CEO Nathan Hancock (lt) and Minister for Agriculture and Water Resources the Hon. David Littleproud MP (rt) announcing funding for citrus biosecurity. Announced in Mildura today by the Minister for Agriculture and Water Resources the Hon. 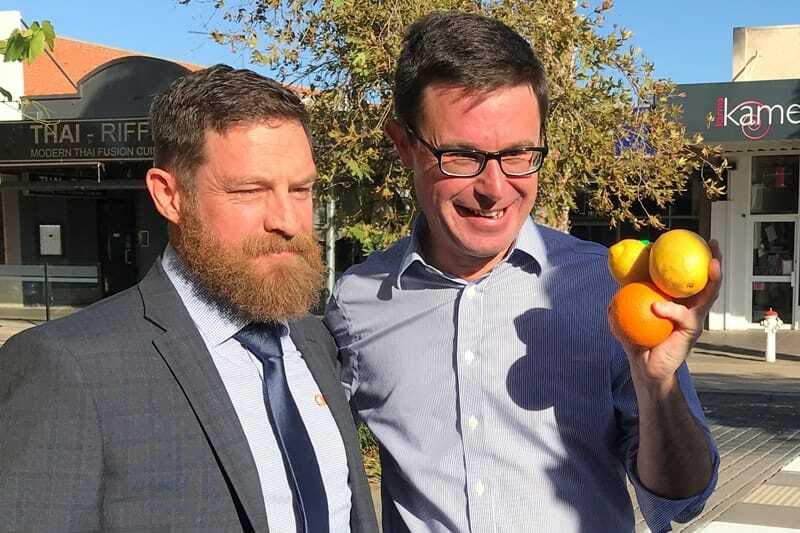 David Littleproud MP with the Member for Mallee Andrew Broad MP and Citrus Australia, the National Citrus Biosecurity Surveillance Strategy is part of the Government’s Agricultural Competitiveness White Paper. Citrus Australia CEO Nathan Hancock welcomed the announcement saying, “Biosecurity is of high importance to our industry and this funding complements the investment by industry into protection against, and preparedness for, incursions of exotic pest species”. The Australian citrus industry is in a buoyant phase with exports setting new records in 2017 reaching 260 000 tonnes, valued at $427 million. This was an increase of 19 per cent in volume, and 31 per cent in value, from the previous year. “Horticulture exports exceeded $1.1 billion in 2017 and citrus accounted for almost 43 per cent of that, so we have a lot to protect,” Hancock said. “Our five–year average annual production is now 750,000 tonnes nationally and I can see that that is only going to increase.”The project will be jointly managed by Plant Health Australia and be overseen by a steering committee that includes growers and industry personnel. The project will be jointly managed by Plant Health Australia and Citrus Australia and be overseen by a steering committee that includes growers and industry personnel, with a project leader to be based in Mildura. “We’re currently recruiting for the project leader and hope to have an announcement soon,” Hancock added. If you see any exotic fruit flies, damaged fruit or anything unusual, report it to the Exotic Plant Pest Hotline 1800 084 881. View the National Citrus Biosecurity Surveillance Strategy 2018-2028.